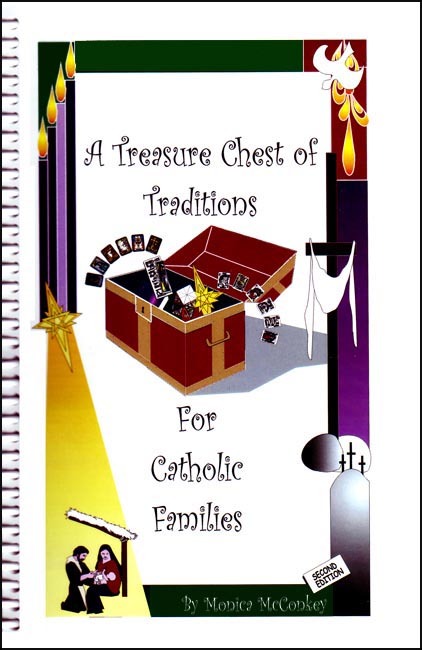 A Treasure Chest of Traditions for Catholic Families offers ideas for activities, crafts and recipes to help families celebrate the various Seasons and Feast Days of the year. With fun-filled activities, you can build your own family traditions while passing on the richness of our Catholic Faith. Guided by the Liturgical Calendar, the book journeys through the Seasons of Advent, Christmas, Lent, Easter and the 2 spans of Ordinary Time. The months of the secular calendar are woven in, providing the context for Feasts and monthly Devotions. Saints are introduced as their Feast Days occur, offering details and legends about their lives and providing suggestions for family activities surrounding them. Various sections within Ordinary Time suggest that this time can be anything but ordinary! A section entitled “Extraordinary Events in Ordinary Time” offers activities surrounding special events in family life (births, moving, Sacraments and “firsts”). A section entitled “Everyday in Ordinary Time” offers ideas for installing other family rituals to bring the family together and integrate the Catholic Faith into daily living. The summer months bring “Cathletics” to Ordinary Time, offering activities to pass on basic catechism, while another section introduces simple prayers for children. Suggested activities are intended to prompt families to actively practice their Faith, delving into Church celebrations and allowing these festivities to spill back into home life. This book is a true treasure for Catholic Families. The activities are simple and easy to do but you gain so much from them - a wonderful book full of great faith enriching activities to use in your home. Copyright 2007. Dimensions: 5.5 x 8.5 inches. Spiral bound soft cover. 302 pp. This book is a delightful resource for homeschool moms interested in the formation of their Catholic children. I love the way it is arranged into liturgical seasons, making it easy to pick up and enjoy at any time!